It is the dead refugees in the Mediterranean that these lines bring to mind, long after R.S. Thomas wrote them. We see God making an altar, not Abel, Abraham, or Moses. John Paul II wrote of the ‘altar of the world’ on which sacrifice is unceasingly offered. Here, where the boat foundered on the rocks, is Calvary, not just for the crew and their beloved, but for Christ. He accepts the tarnished offerings of their lives, (tarnished because all are sinners): their cross is made to fit him, their brother. 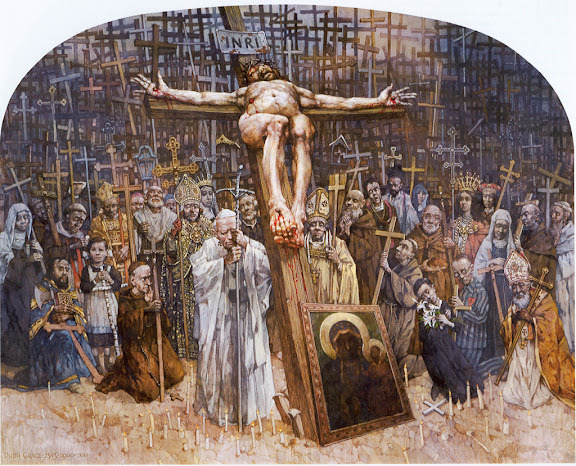 A cross to remember Christ by need not be golden (see Wednesday’s post): this report and photo come from Independent Catholic News, ICN, 20.12.15 . Thanks to the editor, Jo Siedlecka. A stark cross, made from the wreckage of a boat that that sank in the Mediterranean in 2013, drowning hundreds of refugees, was the final acquisition made by the British Museum on Neil MacGregor’s last day as Director, on Friday, 18 December 2015. The cross was made by Mr Francesco Tuccio, a carpenter who lives and works on the island. It is made from parts of a boat that sank near Lampedusa on 3 October 2013, carrying refugees. 500 people were on board when the overcrowded boat caught fire, capsized and sank. Only 151 survived. Some of the survivors were Eritrean Christians, fleeing persecution in their home country. Mr Tuccio met some of them in his church of San Gerlando and frustrated by his inability to make any difference to their plight, he went and collected some of the timber from the wreckage and made each of them a cross to reflect their salvation and as a symbol of hope for the future. In a statement, the Museum said: “It is essential that the Museum continues to collect objects that reflect contemporary culture in order to ensure the collection remains dynamic and reflects the world as it is. The Lampedusa disaster was one of the first examples of the terrible tragedies that have befallen refugees/migrants as they seek to cross from Africa into Europe. The cross allows the Museum to represent these events in a physical object so that in 10, 50,100 years’ time this latest migration can be reflected in a collection which tells the stories of multiple migrations across millennia. The Cross given to Pope Francis can be seen in this video . There is such a thing as a true conscience and a false conscience. Our true conscience is the one that is in touch with God’s law. But it can be submerged beneath a false conscience that is formed not by God’s law, but by all sorts of other influences. Today, it can be difficult to get away from the influence of our culture’s easy-going morality and its message that if something seems good to me, then it is good. It is important to realise that this kind of thinking usually comes from ‘doctrines that have lost the sense of the transcendent or are explicitly atheist,’ as Pope Saint John Paul II said in his remarkable Encycylical Letter, Veritatis Splendor [no. 32]. “We are building a dictatorship of relativism that does not recognise anything as definitive and whose ultimate goal consists solely of one’s own ego and desires” [Mass at St. Peter’s Basilica on 18 April 2005]. Strong words. But what is this “relativism”? It is the popular teaching whereby the individual conscience is held up as the ultimate moral authority answerable to nothing but itself. It refers to no objective criteria by which to evaluate its decisions; the only requirement is that of personal sincerity. It does not refer to anyone else to discover what is right. Personal sincerity is considered sufficient to justify any action. In relativism, there is no awareness that if personal sincerely is the only yardstick by which I measure the moral content of my actions, moral chaos soon results. What if, for example, I sincerely believe that causing harm to my next door neighbour is good because I sincerely believe him to be wicked? Or, what if I sincerely do not believe that the foetus of a human being is human? To call such exaltation of personal opinion a “dictatorship” is not too strong. We try to tell ourselves that this way of thinking is tolerant of different points of view. But what of the point of view of the one who is weaker than myself, and whose human existence and potential I “sincerely” do not acknowledge? If you are even reading this post, you probably would not go to the lengths I have just described, but it is not necessary to ascribe consciously to such relativist or individualist doctrines in order to be susceptible in a lesser sense to the kind of thinking that goes with them. The selfish tendencies that we all have as a result of our fallen nature can make it hard, at least at times, to realise that conscience is not about personal sincerity. Then what is conscience about? Conscience is directed beyond ourselves toward God and true goodness in a manner similar to the way a compass directs a traveller toward her destination. The difference is that the traveller knows before she sets out that she doesn’t want to go round in circles, stay in the same spot, or end up further away from the place of her destination. We expect a compass to direct us to a place that is different from the place where we began. We do not necessarily have the same expectation with regard to our conscience. We might prefer it if our conscience would kindly sanction what we are doing, or planning to do. We don’t want it to challenge us or deprive us of our fantasy. 8 October: Our Inward Mirror or Conscience. By calling this blog a Mirror we set out to be reflective. Recently Sister Johanna wrote to the editor offering some reflections on conscience, that human attribute by which we can perceive, if through a glass darkly, the soiled image and likeness of God in our hearts (1 Corinthians, 13:14). Allow her wisdom, distilled from Aquinas, John Paul II and Benedict XV, to percolate through your brain and heart. I’m sure you’ll agree that I was right to accept her offer. Anne continues by exploring the prayers of Saint Faustina on the healing Blood of Our Lord. We know through the writings of Saint Faustina (canonised by St John Paul II in the Year 2000) in her diary ‘Divine Mercy in my Soul’ that Jesus wants us to know that the Blood and Water which gushed forth from His side on the Cross continues to be poured out upon us as a fount of mercy for us. He wants us to call on that mercy all the days of our life. And your gift of eternal Love and Mercy. The person is an entity of a sort to which the only proper and adequate way to relate is love. Love is concerned with persons directly and immediately: the affirmation of the value of the person as such is of its essence. To the structure of the person belongs an ‘interior,’ in which we find the elements of spiritual life, and it is this that compels us to acknowledge the spiritual nature of the human soul…. This determines the value of the person. The fundamental ethical characteristic of love…is an affirmation of the person or else it is not love at all. If it is informed with a proper attitude to the value of the person, it is love in all its fullness. Love in the full sense of the word is a virtue, not just an emotion. This virtue is produced in the will…. The will, then, is the source of the affirmation of the person which permeates all the reactions, and all the feelings, the whole behaviour of the subject. Can there be even more? Yes: our love, our personhood is meant to take its form from the person of Christ. Although we are ‘not interchangeable’ with any other person on the level of our free will, we can experience union with Christ and with others. But how can this be so? Haven’t I just said with Karol Wojtyla that a person is “not capable of transmission”? How then can we be united to others without losing our identity? We will explore this question in tomorrow’s post.